It will be a day forever remembered. My voting was only a simple act, I went, I identified myself, got my finger stained, filled out a ballot, and dropped it in a box. It is not a complex or grand process to the eye, but it is one that I will forever remember and will recount to my children, and their children. And God willing it will be remembered through the ages. More Iraqi blogger accounts are here, here, and here. Now, I want to close with a kind of personal recollection as I start here, and that is that the last time I was in government was actually 1989 to 1991. And that, too, was an extraordinary time. I was lucky enough to be the White House Soviet Specialist at the end of the Cold War. It doesn't get much better than that. And I got to participate in German unification and the liberation of Eastern Europe and the peaceful collapse of the Soviet Union. But, you know, I realized that I was just harvesting good decisions that had been made in 1946 and 1947 and 1948 . . . .
You think about it. In 1947, civil wars in Greece and Turkey; and in 1948, the permanent division of Germany, thanks to the Berlin crisis; and in 1949, the Soviet Union explodes a nuclear weapon five years ahead of schedule and the Chinese communists win. While no one might have been able, at that time, to imagine a democratic Germany or a democratic Japan, when President Bush now sits across from Chancellor Schroeder or from Prime Minister Koizumi, he sits across not just from a friend, but a democratic friend. I know that there are those who wonder whether democracy can take hold in the rocky soil of the West Bank or in Iraq or in Afghanistan. I believe that we, as Americans, who know how hard the path to democracy is, have to believe that it can. What amazing times we are living in. It is 1946, 1947 and 1948 again. SAFIRE: I think history will look back and say it was definitely worth it, because, if we can turn around Iraq, which was the worst of all the countries in the Middle East, if we can instill some sense of democracy and freedom there, we can change the world. . . . I think the mood in the Middle East changed with our regime change of Iraq and, of course, with the demise of Yasser Arafat. BLITZER: So you see a connection between Iraq and the Israeli-Palestinian conflict? 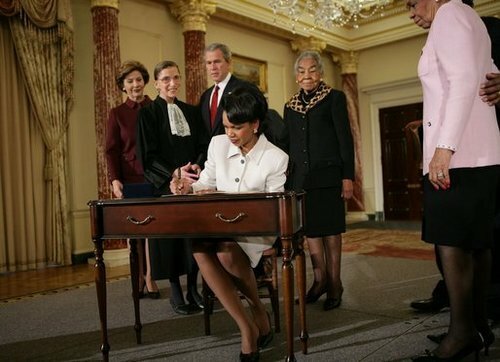 Secretary of State Dr. Condoleezza Rice signs official papers Friday, Jan. 28, 2005, after receiving the oath of office during her ceremonial swearing in at the Department of State. Watching on are, from left, Laura Bush, Justice Ruth Bader Ginsburg, President George W. Bush and an unidentified family member. A black Secretary of State, sworn in by a Jewish Supreme Court Justice -- both women -- appointed by former governors of Arkansas and Texas, witnessed by the appointee’s relatives from Alabama, where they had grown up in a segregated society, a few generations removed from slavery. I want to thank the members of my family and my friends who are here -- a number are here from Birmingham, Alabama, and they represent generations of Rices and Rays, who believed that a day like this might somehow be possible. . . . Standing for the cause of liberty is as old as our country itself. Indeed, it was our very first Secretary of State, Thomas Jefferson, who said, "The God who gave us life, gave us liberty at the same time." America's story is the story of men and women ceaselessly striving to ensure that we as a nation live up to the ideals set forth by our forefathers. Our founders realized that they, like all human beings, were flawed creatures, and that any government created by man would not be perfect. Even the great authors of our liberty sometimes fell short of their ideals -- even Thomas Jefferson, himself. Yet, our forebears established a democratic system of, by and for the people that contained within it the means for citizens and -- of conviction and of courage to correct its flaws. The enduring principles enshrined in our Constitution made it possible for impatient patriots -- like Frederick Douglass, and Abraham Lincoln, and Martin Luther King -- to move us ever closer to our founding ideals. Jewish Current Issues is nominated for a 2004 Jewish and Israeli Blog Award in the categories of "Best Politics, Current Affairs, and Academia Blog" and "Best Jewish Culture Blog." Voting runs through Sunday morning Israeli time. Based on the current results, however, I’m working on my “Honor Just to be Nominated” speech. At the Auschwitz concentration camp, evil found willing servants and innocent victims. For almost 5 years, Auschwitz was a factory for murder where more than a million lives were taken. It is a sobering reminder of the power of evil and the need for people to oppose evil wherever it exists. The 60th anniversary . . . is an opportunity to pass on the stories and lessons of the Holocaust to future generations. The history of the Holocaust demonstrates that evil is real, but hope endures. Samuel Pisar’s story of evil and hope appeared in today’s Ha’aretz. Pisar is a distinguished international lawyer in Paris, New York and London, and the author of "Of Blood and Hope." On January 27, 1945, he was a 15-year old boy in Auschwitz, his father executed by the Gestapo, his mother and little sister herded into a cattle car in front of him, never to be seen again. In the autumn of their lives, the remaining survivors of Auschwitz feel a visceral need to transmit to new generations the memory of what we have experienced in our flesh and our souls, to warn our children that today's spreading intolerance, hatred, fanaticism and violence can destroy their world as they once destroyed ours . . . .
Because we know from bitter experience that the human animal is capable of the worst, as of the best, of madness as of genius, that the unthinkable, the unimaginable, remains possible. . . .
Mankind, divided and confused, still hesitates, vacillates, like a sleepwalker on the edge of an abyss. But the irrevocable has not yet happened, our chances are still intact. Pray that we learn how to seize them. Read his story, and then seize this chance. Grandfather Eliezer was an important man. but she was "an angel,"
even though she could ill afford it. Where are they? I have pictures to prove they existed. Yet some would deny that it happened. Another Aunt Sarah, a great beauty. Another three children, geniuses all. I know, I have pictures. The pretty and the plain. The smart and the simple. Where are they? The aunts and the cousins. I was never to meet. I am left with their faces in the photographs. In a part of my heart I keep safe. The memory of people I never knew. There is the number A12311. Littleoldlady gives the significance of the tattoo here. Of her poem, she says "it's all true -- every name, every relative. Some people don't need liberation ceremonies to remember Auschwitz. They will never forget, much as they try." The rest of us need to know. Start here. The commentary on George W. Bush’s Second Inaugural Address has noted its connection to themes advanced by John F. Kennedy (a point also noted here in connection with Bush’s acceptance speech last September), and to the themes of Natan Sharansky in his essential book. But the hidden literary image in Bush’s Second Inaugural is “fire” -- a word that appears four times in the address. For a half century, America defended our own freedom by standing watch on distant borders. After the shipwreck of communism came years of relative quiet, years of repose, years of sabbatical -- and then there came a day of fire. [B]ecause we have acted in the great liberating tradition of this nation, tens of millions have achieved their freedom. And as hope kindles hope, millions more will find it. By our efforts, we have lit a fire as well -- a fire in the minds of men. It warms those who feel its power, it burns those who fight its progress, and one day this untamed fire of freedom will reach the darkest corners of our world. Roger Clegg noted that the phrase "fire in the minds of men" comes from Dostoevsky’s novel "The Possessed" (the "most famous novel in world literature about terrorism"), and was taken by James Billington as the title for his 1980 book, "Fire in the Minds of Men: Origins of Revolutionary Faith." "He’s putting out the fire, sir." "Not likely. The fire’s in the minds of men, not on the roofs of houses." A fire came on September 11 to the roofs of our tallest buildings. That fire has been put out, and we have "lit a fire as well" -- a fire in the minds of men. That fire has already begun to reach the darkest corners of our world. It came to Afghanistan, where millions of men and women braved physical danger to vote. It came to the Ukraine, where millions voted and then overturned a fraudulent count. It will come to Iraq on January 30, where millions more will literally risk their lives to vote. [P]eople think this is just President Bush. This is a big mistake, that he's the only one in the world thinking about democracy in the Middle East. What's important here, is the reason why these elections are resonating is that this message of the president -- it's because the people on the field want it. They want it no less than the people in the White House. Their view is, Elections are our only vehicle to get new blood in who want a more democratic society. We know how the Arab societies are based, and we don't want another Arab state. Every Arab that I meet who is a reformist said, "We don't want another Arab state." Yesterday, the New York Times covered the controversy over the remarks of Lawrence H. Summers under this headline: "No Break in the Storm Over Harvard President’s Words." The Times quoted a dean from another university as saying the aftermath was an "intellectual tsunami," reported that a physics professor had sent "a note to his students assuring them that they were appreciated," quoted from "an angry e-mail message" sent by an associate professor at the School of the Art Institute of Chicago -- who had taken a "demanding theoretical math sequence" at Harvard 28 years ago -- and asserted that "[p]erhaps the most outraged were prominent female professors at Harvard" (a total of one was quoted in the article). In his talk Friday at a conference on women and minorities in science and engineering, held at the National Bureau of Economic Research, Summers listed three possible explanations for the small number of women who excel at elite levels of science and engineering. He said he was deliberately being provocative, as he was asked to do by the organizers, and relying on the scholarship that was assembled for the conference rather than offering his own conclusions. His first point was that women with children are often unwilling or unable to work 80-hour weeks. His second point was that in math and science tests, more males earn the very top scores, as well as the very bottom scores. He said that while no one knew why, "research in behavioral genetics is showing that things people attributed to socialization" might actually have a biological basis -- and that the issue needed to be studied further. Summers' third point was about discrimination, and he said it was not clear that discrimination played a significant role in the shortage of women teaching science and engineering at top universities. However, he concluded by emphasizing that Harvard was taking many steps to boost diversity. For these remarks, Summers issued a lengthy letter of apology yesterday. Those interested in more dispassionate coverage than in intellectual tsunamis, angry emails, sensitive physics professors, and speculation on who "perhaps" might be the "most outraged," might consult the Harvard Crimson, which ran six different stories yesterday: here, here, here, here, here, and here. Here is an excerpt from the Crimson’s interview with Johnstone Professor of Psychology Steven Pinker, who teaches the popular Harvard core class "The Human Mind:"
PINKER: First, let’s be clear what the hypothesis is -- every one of Summers’ critics has misunderstood it. The hypothesis is, first, that the statistical distributions of men’s and women’s quantitative and spatial abilities are not identical -- that the average for men may be a bit higher than the average for women, and that the variance for men might be a bit higher than the variance for women (both implying that there would be a slightly higher proportion of men at the high end of the scale). It does not mean that all men are better at quantitative abilities than all women! That’s why it would be immoral and illogical to discriminate against individual women even if it were shown that some of the statistical differences were innate. Put the New York Times in that group. It is a measure of the current status of the Paper Formerly Known as the Paper of Record that its journalism has sunk below that of a student newspaper. But at least, in this case, its coverage didn’t risk physical harm to those who strayed from the approved text. Yesterday at the Dohany Street Synagogue in Budapest, more than 1,000 people gathered to commemorate the 60th anniversary of the liberation of the Budapest ghetto, where tens of thousands of Jews were enclosed near the end of World War II. Around 550,000 of Hungary's 800,000 Jews were killed during the Holocaust. Most of those who survived were in Budapest, including those in the ghetto. Others were in specially designated "Jewish houses," and around 20,000 lived in hiding all around the city. At a religious service in the Dohany Street Synagogue, Chief Rabbi Robert Frohlich spoke about the contradictory feelings of Tuesday's commemoration. "We mourn because a whole Jewish world was destroyed in the Holocaust, because our family members were murdered," Frohlich said. "But we also rejoice because we were saved and we give thanks for the liberation and for the life we received." . . .
"The Holocaust in not one among many sins, but sin itself," [Prime Minister] Gyurcsany said to more than 1,000 people gathered in the synagogue. "It is the modern repetition of ancient sin and there is no forgiveness for it." Jozsef Schweitzer, Hungary's former chief rabbi, recalled his own experiences during the ghetto's existence and recounted that the synagogue where Tuesday's memorial was held was then used by the Nazis and their Hungarian allies, the Arrow Cross, to round up Budapest Jews. "I was brought to this temple and I felt that nothing too bad could happen to us here," said the 82-year-old Schweitzer. "But this was a time of terror, dread and shame." Anne Lieberman has had some posts over the past few days that are not only worth reading, but worth cataloguing in one place to read again. She sounds her clarion daily in "Boker tov, Boulder" (as in “Wake up, already!”), alerting a world in Boulder and beyond, standing sentry on an electronic wall, watching over local press and worldwide media, writing to newspapers and to rabbis who are afraid, celebrating both Friday and Shabbat, starting very early each morning, sometimes with pictures worth thousands of words. This past week, she captured the disparity in power between Israel and the terrorists (it is the opposite of what you might expect), the utter atrocity of the murder of one man fixing a fence to protect others, the sheer enormity of a Christian family unsafe in New Jersey. They are all worth (re)reading in their entirety. And coming back to from time to time. If you want a glimpse of how I think about foreign policy read Natan Sharansky's book "The Case for Democracy." Anybody read it? Read it. It's a great book. And I think it will help -- it will help explain a lot of the decisions that you'll see being made -- you've seen made and will continue to see made. And it will help explain what's going to happen in the Palestinian territories as far as we're concerned. For government, particularly for opinion makers, I would put it on your recommended reading list. It's short and it's good. This guy is an heroic figure, as you know. It's a great book.